Boat lift canopies are used to protect boats from natural destructive forces such as the wind, rain and the sun’s ultraviolet rays. Many captains with a wide variety of boat shapes and sizes wish to extend the life of their vessel. Custom boat lift canopies are available by CoverTuff and cover the following boat lifts: Shore Station, Lakeshore, Pier Pleasure, Daka, Newman, Porta Lift, Floe, Feighner, Midlander, Shoremaster and Hewitt. Both CoverTuff canopies come with installation instructions and mounting hardware to secure the item using a bungee system. Older canopy covers often use a spring loaded pin that locks the tubular sections of a canopy into place at a selected position. Newer canopies provide for secure installation by using bungee cords that attach to the product’s framework. Some models use several individual bungee cords, while others use a single continuous cord that ties to the canopy’s frame. Boaters can order custom boat lift canopies that fit their exact measurements and specifications. Many are composed of threads that are resistant to UV rays, and included welded, double needle seams to improve leak resistance. 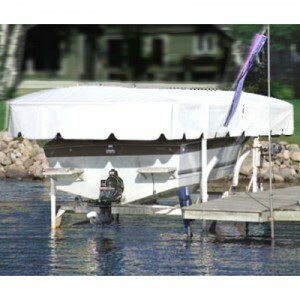 Visit CoverTuff Custom Boat Lift Canopy Covers to aid in measuring and fabric selection with your custom boat lift cover.